Good evening fellow scrappers! Hope you're all having a wonderful Valentine's Day. It's the day of 'Love' so make sure you give all your loved one a big hug & kiss. Let's not forget that love encompasses much more than just the love between you & your sweetie. There's the love shared between parents & children, the love between you & your parents, the love shared amongst friends & I can't leave our four legged companions behind--there's also the unconditional love that our pets provide. 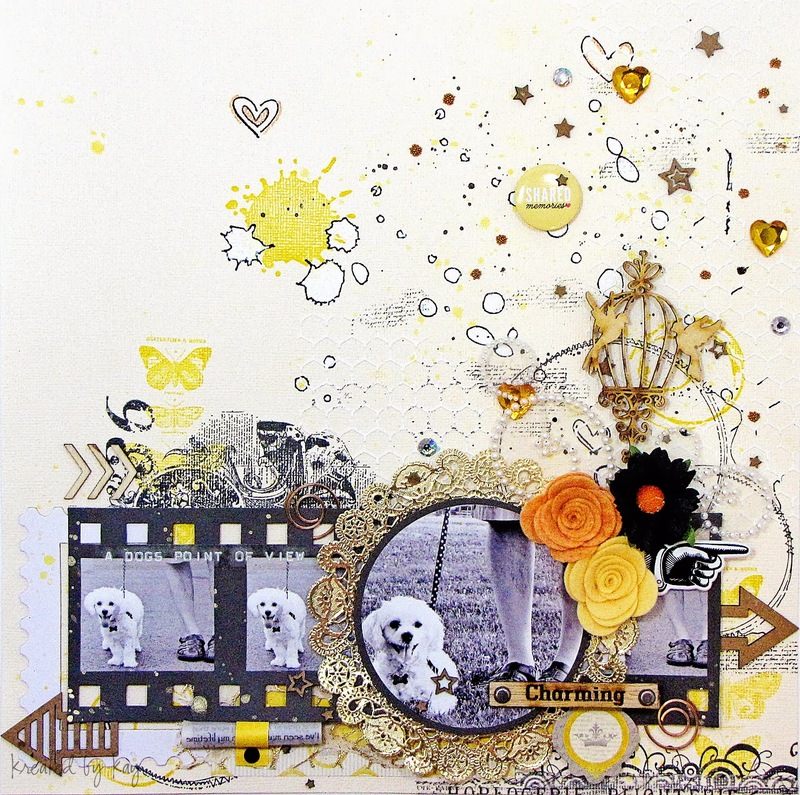 This layout just so happens to be based on our family dog Toby. 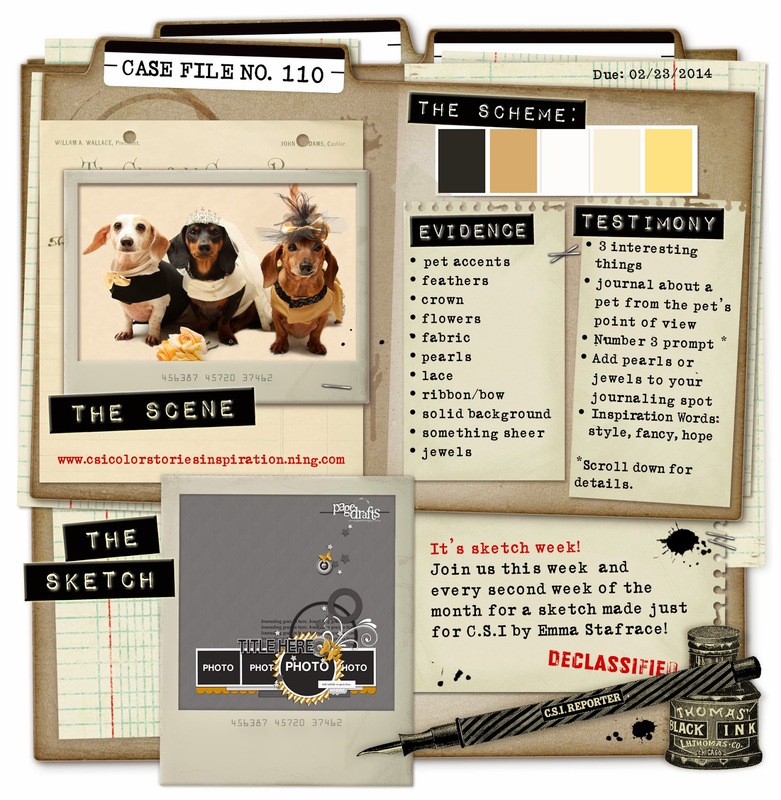 I 'made' time to play along with CSI's Case No. 110. First of all, I once again loved the theme & second Emma provided one of her fabulous sketches! I couldn't resist. Her sketches cut down my scrap time practically in half since I don't have to sit there for hours trying to figure out a design that I'm happy with. Here's Case No. 110. I incorporated all of the colors & Em's sketch. For my evidence I have: crown, flowers, pearls, jewels & a somewhat solid background (I added my own design--it originally was a solid piece of cream colored card stock. For the testimony, I wrote my journaling from Toby's point of view--or at least what I believe he may be thinking. As mentioned, I started off with a solid piece of cream colored card stock for my background. 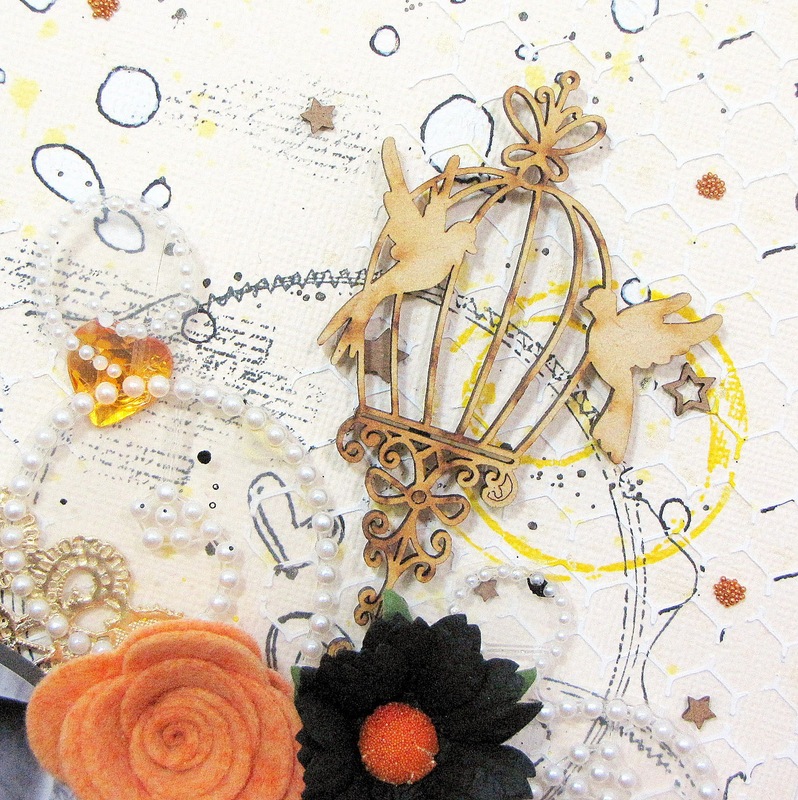 I added all the designs & texture with the use of masks, stamps & embellishments. Once again I did some coloring on this page. With a white gel pen I 'colored' in the splats & splatters that I traced with the use of a Crafter's Workshop stencil. 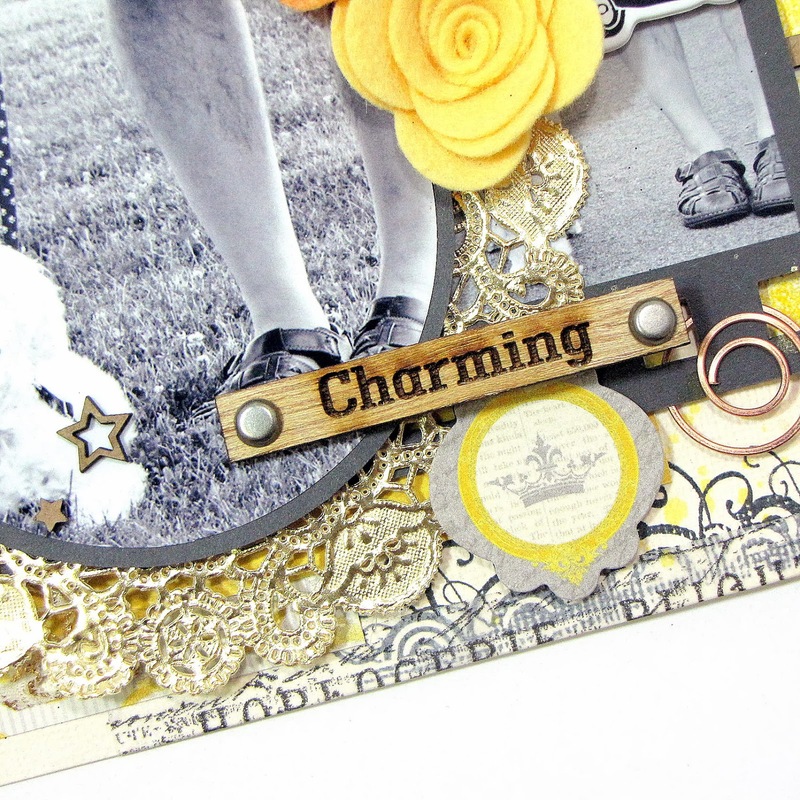 I used molding paste to add a bit of texture along with a Prima Marketing stencil. To mat my large circular photo I used a 5" inch gold doily. 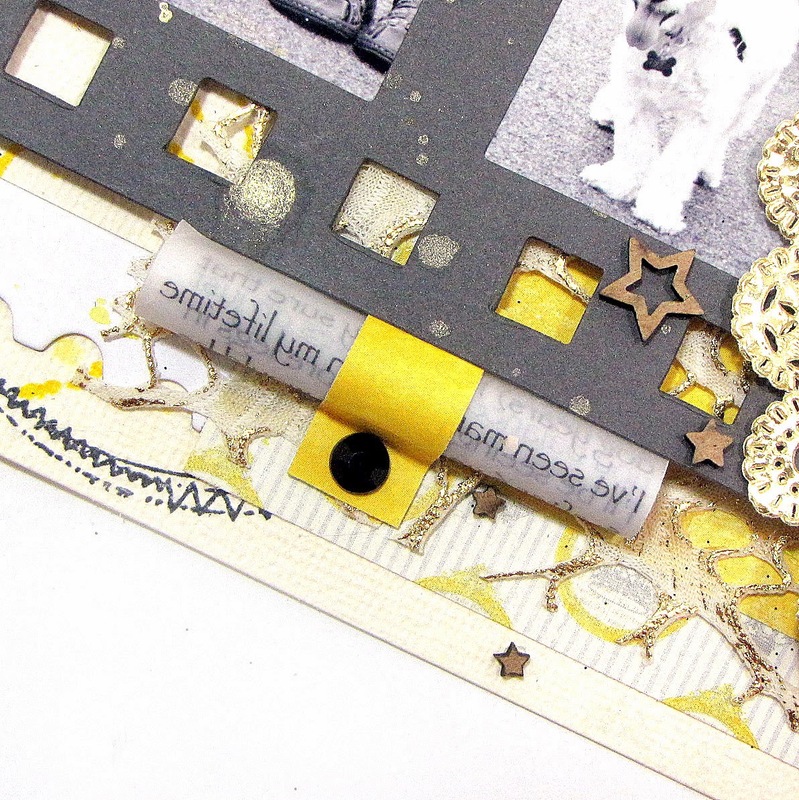 I applied some stamping & tissue tape along the right bottom of my page. Wow, so I've recently discovered the wonders of tissue/washi tape! As usual I'm eons behind everybody else. I just never had any in my stash until recently & I'm enjoying the different effects & things you can do with these tapes. Here's my journaling stored in one of my fave ways which is in a scroll. I include journaling/story/thoughts in every one of my layouts. So I've experimented with different ways to store my journaling besides writing onto the back of my pages. If interested how I make these scrolls--feel free to check out a tutorial I made for these here. I wrote the journaling based on how I feel Toby thinks just by observing his personality through all these years. Journaling reads: I've seen many legs in my lifetime & after 6 years (that would be human years--I've lost count as to how much that would be in dog years) I'm pretty sure that I'll be seeing many more legs in the future. To me, seeing legs is about as common of a view as faces are to you humans. How you balance yourselves on just two legs is beyond me--I personally need all four of mine. However, none of this matters--you are my family & though I may not be able to talk, I do listen & communicate my thoughts through my eyes & tail. I do not have a shoulder for you to cry on but I do my best to comfort you by lightly laying my head on your lap. I may not be able to hug you but I will stand by you when you are lonely. I feel that I should always try my best to make you laugh--even when you're feeling sad & I know that I love you unconditionally & have pledged my everlasting loyalty to you. To my sweet Toby--the best dog in the world! These felt flowers are items that I bought off an Etsy shop called The Felt Shoppe--they are so well made & the felt adds a soft touch to my page. The owner has several items all made with--you guessed it...lots of felt! Once again I used my Dymo label maker to make my title. I'm loving this little gadget! Don't forget to pay CSI a visit. Don't forget that I'm one of the sponsors for February & one lucky person will win a voucher to my shop. Thanks to all of you who stop by for a visit--enjoy the rest of the week! Love Love Love all the details!! I love the signature scroll Kay! Oh Kay what adorable pictures and fun embellishments. Love the layout & so many details to note, stunning. Darling LO, Kay!!! I always love to see what you are doing with your amazing creative talent! Ok Kay.. of course I"m totally blown away by the use of the UWS... but is that CLEAR DYMO TAPE!?!?!?! ?